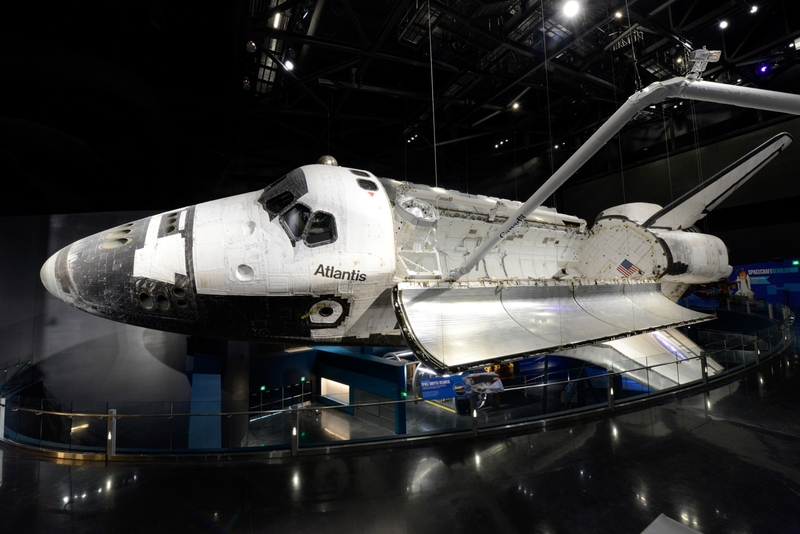 Kennedy Space Center Visitor Complex in Florida has now opened the doors to the world’s most comprehensive and interactive attraction devoted to NASA’s 30-year Space Shuttle Program – Space Shuttle Atlantis. Of the three space-flown orbiters distributed by NASA to science centers and museums throughout the country, only Atlantis is the focal point of a $100 million, 90,000-square-foot attraction containing four multimedia and cinematic productions and more than 60 interactive experiences that invite guests to “be the astronaut” and to celebrate the people, passion and patriotism behind the shuttle program. Space Shuttle Atlantis is included in regular admission to Kennedy Space Center Visitor Complex. Developed by Delaware North Companies Parks & Resorts, operators of Kennedy Space Center Visitor Complex for NASA since 1995, as well as St. Louis-based PGAV Destinations, in partnership with NASA, Space Shuttle Atlantis is the marquee element in a 10-year master plan for the Visitor Complex. Here, top-of-the-line audio/visual and show systems, theme park technology seen in Orlando’s newest and most popular attractions, seldom seen NASA images and footage, and reality-based astronaut training simulations combine to create a first-of-its-kind attraction. This completely immersive experience is about much more than seeing Atlantis close-up. With hi-fi replicas, simulators and interactive activities touching on all aspects of the shuttle program and its accomplishments, including the Hubble Space Telescope and the International Space Station, it’s the closest guests can get to living and working in space – short of applying to the astronaut corps. How it once used to be. 184-foot-tall vertical replica of the space shuttle’s external tank and two solid rocket boosters, giving visitors a true sense of the awesome power needed to launch the shuttle into orbit. The entrance walkway is lined with river rocks from Kennedy Space Center’s crawlerway, upon which Saturn V rockets and space shuttles were transported to the launch pads. • The Building – Space Shuttle Atlantis features two sweeping architectural elements, or “wings,” representing the space shuttle’s launch and return. The outer layer of the building, cloaked in iridescent hues of orange and gold, represents the fiery glow of re-entry. The taller, internal wing of the building is covered in a shimmering gray tile pattern representing the tiled underside of the orbiter. The building is designed to meet LEED Silver sustainability standards. • The Preshow – Multimedia and cinematic presentations build anticipation by illustrating the evolution of the 30-year Space Shuttle Program and the thousands of people who took part in creating and maintaining NASA’s five space-flown shuttles – Columbia, Challenger, Discovery, Atlantis and Endeavour. • Hubble Space Telescope Theater – A high-fidelity replica shows the Hubble Space Telescope in all of its glory, 43 feet long and 14 feet in diameter, with its solar panels fully deployed. A cinematic production in the 40-seat theater shows highlights of the Hubble program, including its 1990 launch, subsequent repair missions and stunning images of deep space. • International Space Station Gallery – Guests can climb aboard a high-fidelity replica of ISS modules and experience the sensation of floating in space. An interactive touch screen offers a variety of topics about living and working aboard the ISS. The topics are then explained using real footage shot exclusively for the Microgravity Theater by actual ISS crewmembers, shown in zero gravity inside the ISS. Freestanding pods recreate components of the station, including upside-down astronaut sleeping quarters and the space potty. A 16-foot-long, four-foot-tall interactive media wall tracks the location of the ISS and provides downloads from the crew’s Twitter feed, as well as exciting updates about the scientific research conducted. • Astronaut Training Simulators – Future astronauts can practice landing the orbiter, docking to the ISS and manipulating the robotic Canadarm on 21 consoles modeled after actual NASA training simulators. 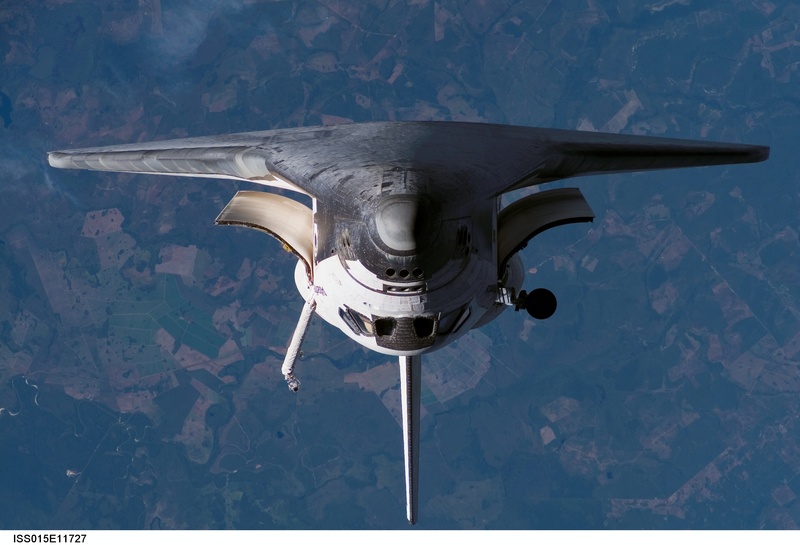 • On Orbit Gallery – The 24-foot-long interactive Space Transportation System (STS) Timeline brings NASA’s 135 space shuttle missions to life with details on every launch, landing, astronaut, payload and more. Banks of interactive monitors provide an “X-ray” view of Atlantis’s crucial systems and prerecorded views of its interior, including the cockpit, middeck and payload bay. At the rear of Atlantis, guests can see an actual 8,000-pound space shuttle main engine. Virtual reality simulators invite guests to test their spacewalking skills, while budding commanders can take the controls in a space shuttle cockpit replica. • Space Shuttle Processing Area – The authentic “beanie cap,” or vent hood, from Launch Pad 39B finds a new home at the “Blast Off” game in which guests can kick together virtual molecules of hydrogen and oxygen to create the space shuttle’s liquid fuel. They can also try their hand at virtually mating the orbiter to the shuttle stack in the Vehicle Assembly Building. The wheels and tires from Atlantis’ final mission, STS-135, are also available for guests to touch and spin. Thanks a lot dear for appreciating!